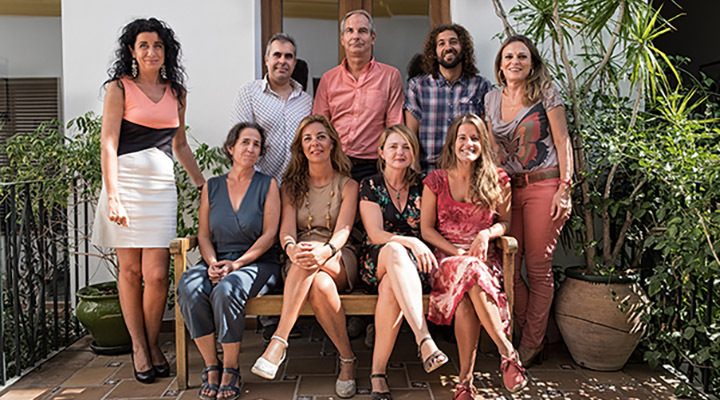 High quality language teaching and learning, a fantastic location directly on the Atlantic coast, a perfect climate, real Andalusian hospitality, intensive, individual advice and support, high quality accommodation with a wide range of choices, free-time activities to suit every taste. We have a fantastic team of older and younger male and female teachers, who all speak Spanish as their mother tongue. All our teachers have an academic qualification and regularly take part in training sessions. Besides individual students we regularly have school groups from secondary schools, from institutes for professional training and from adult education centres. Nearly every day we receive emails or phone calls with tremendously positive feedback. Our language teaching is at the highest level of competence. 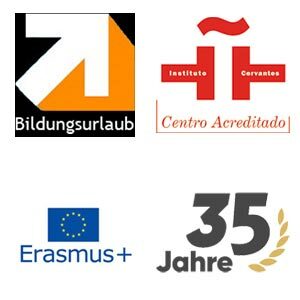 We have been teaching Spanish as a Foreign Language for more than 30 years and are regularly inspected and certified by the Instituto Cervantes. Our major focus is on developing your individual communication skills. While maintaining high professional standards, we try to create a warm and friendly atmosphere, a prerequisite for learning with confidence and ease. Conil is situated only 40 km from Cádiz, 100 km from Gibraltar and 150 km from La Costa del Sol. Such a privileged location allows easy access to the rest of Cadiz Province; the area is full of sites that are of touristic and cultural significance. In terms of transport connections, the airports of Jerez, Gibraltar and Málaga are all very accessible and have flights serving many different English cities. In less than 3 hours from England, you can find yourself immersed in the intense blue Atlantic Ocean of Andalusia. With warm temperatures and brilliant sunshine, Andalusia is synonymous with an ideal climate, boasting over 300 days of sun per year and an average temperature of 18º C. It´s hard not to have a fantastic experience with our weather! Without a doubt this influences the people of Andalusia – our character is happy, open and welcoming – making all the difference to your stay. Because of our small class sizes and experienced teachers, we create an atmosphere of trust and cohesiveness between our students. We find that giving each student the personal attention that he/she deserves, whether in regard to coursework, accommodation or the organization of activities, allows us provide the student with a fully enjoyable, effective and relaxed learning experience. At Atlantika we offer the option of accommodation in modern and welcoming apartments, shared with other Academy students. Situated in the centre of town, our rooms are close to tapas bars; restaurants, shops and only 5 minutes walk from the beach. We also provide private lodging for accompanying teachers and monitors of school groups in the same building. It is impossible to be bored while in Conil. 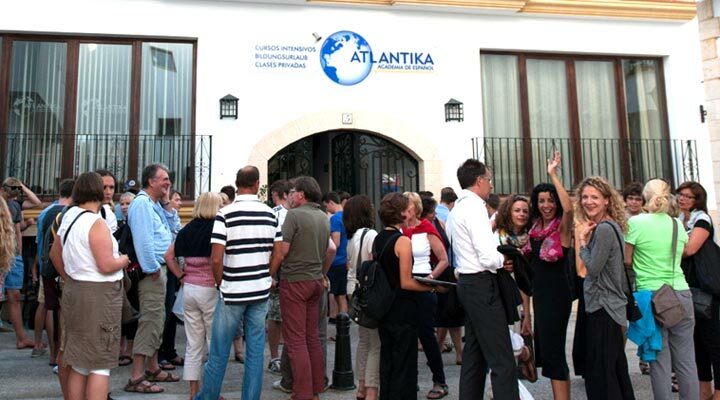 At Atlantika we offer activities that complement our courses and contribute to your regular use of Spanish. From cultural talks and hands-on presentations of Spanish cuisine and preparation, to excursions and Spanish film screenings. Conil is a sport-lover´s paradise, with opportunities for surfing, kite surfing, tennis, golf, hiking and cycling. Or, if you just want to relax, there are fantastic beaches for swimming or long walks. As everyone knows, however, this is not enough to make a perfect teacher. A language course is only a real success if the teachers understand how to make learning fun and when they get everyone in the class overcoming any shyness and speaking freely. We are happy to be able to say that our teachers manage this time and again. They are experts at creating an atmosphere in which students are able to lose their inhibitions about speaking and just enjoy joining in. This is the main reason why learning at the Academia Atlántika is so effective. Besides individual students we regularly have school groups from secondary schools, from institutes for professional training and from adult education centres. Very many of our students come back again – some have been coming regularly for ten years or more!